UPDATE: Jetpack plugin now includes this capability so I no longer use this plugin (although I still love Mailchimp). I originally could not get this to work, so I posted to the WordPress forum seeking help… then I figured it out. Since then others have had the same issue. So I wrote a “how to”. You should have already created a list and placed the sign up form somewhere. You may not need to go through all this if you set the template within WordPress in the autoChimp settings to “Post to Blast Custom” then send your first post over. You should see this new template in MailChimp and you can modify the design through the MailChimp interface. Top right, Code your own, choose Code a template. Notice the view options Code and Design options at the very bottom. Go into the design to set up the look and feel as you want. To get back into code view, hit the arrow under the screen-shot thumbnail of your Template screen. Edit Code. Save your template. Note: The above *|MC:SUBJECT|* will repeat the subject as the header of the email inside the body. You can remove that line if you want. Do a test send. See if it worked. To get back into code view of your template go to Campaigns > My Templates> (Down arrow) Edit Code. If all is well, then reset your Auto chimp to its final send settings (out of test mode). And you are good to go. Cancel that. We got it. Thanks for the tutorial Heather! Hi, I have tried the above a few times now, but still no luck? My header comes up perfectly, but where the body of the email (i.e. my blog post) should be, there is only 3 dots. Any help would be greatly appreciated! Thanks! Hi Heather, Thanks so much – got it – YAY! Is there any way to have the feature image that I use in the blog post come up between my logo and title? And ideally I don’t want the whole post to appear since I want people to click through to my site – is there a way to do that without ticking the “only show excerpt”box? Thanks so much for your help! Sorry Nathan, No, I havent managed to figure that out. I think we need a developer to fix it or the plugin author. Thank you very much for this tutorial. I’m new to WP and would never have figured this out on my own. With your instructions, I got it working on the first try. Oh, thanks for the note Steve. Glad to help. Well that saved me a lot of time 🙂 Thanks so much for posting. Great info, thanks for that! Oh great news! Thanks for sharing Cris. Good luck! Will the emails still work with this? Does not work anymore unfortunately, as there is no “My Template” secion anymore in the current MailChimp! Heather thank you for your post. 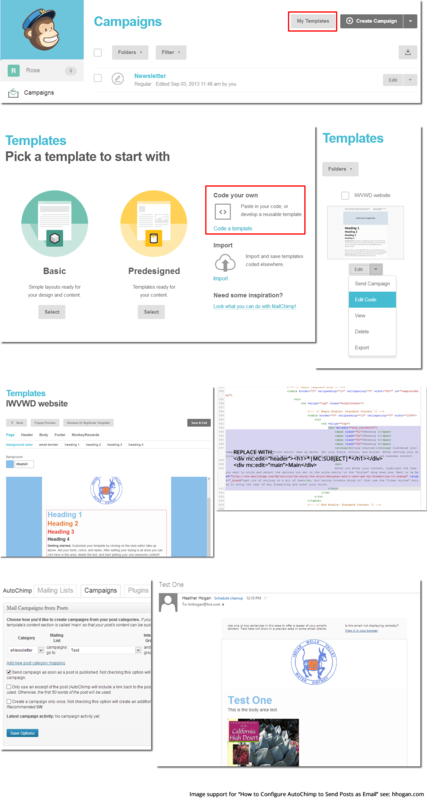 I have gotten to creation of the coded template, which for those who are asking, there are a bunch of merge (short) codes here – http://kb.mailchimp.com/article/all-the-merge-tags-cheatsheet#Personalize you can insert to enable title, image, excerpt etc to be insterted. I haven’t actually tested mine yet, but, a question I have is about line 392 to instert you div tag. My code only goes to line 36. Maybe I am looking in the wrong place. Hello. I try now to configure mailchimp, but can not set my template correct. Made this simple custom email temlate as shown in this post. but Main does not work at all, and I get empty space, nothing shows up. Could somebody help me to sort out this bug? Make sure your div tag isn’t nested inside another div tag. If you’re copy and pasting in the design side it will not translate properly. The designer mode adds code around it that will block it from working. Hi Karam. That’s big help, Thanks. I’ve a question. Not sure why but every time we edit a post, it autosends. Can anyone help? There is a checkbox that relates to that option in the settings. I don’t see how I can send an eblast out that I can design to have two columns, and use the niced design editor. Also how to send an eblast with more than one article from WordPress? For that level of customization you will need to go into MailChimp (MC) and build your newsletter. I think there was an option to copy it over to MC as a draft then tweak it? What a lifesaver! Just to clarify to other users: I thought coding your own template would be difficult because I didn’t realise that it’s the same as using one of their standard templates except you can also access the code. But it’s actually quite simple. This workaround fixed the problem of not being able to find my template when I used Autochimp. I searched EVERYWHERE until I found this, so thank you so much for posting! Question for you: is there a way to have your custom template be mobile-friendly? I notice when I preview my new template that it doesn’t scale on the phone, which seems like a real flaw. Email clients are still pretty fickle when it comes to mobile (last I heard Gmail on iOs didn’t read media queries), but if you design the template to fit a small width you can fake it. Do you have any idea why I am unable to save the Save campaign as soon as a post is published option? Our site has used mailchimp for several years and just the other day I needed to do some work and wanted to be sure emails would not be sent out so I unchecked it. Now when I check it and save it doesn’t save. I also can’t delete any of my post category mappings. Any thoughts would be appreciated. I have the current version 2.15 and current WordPress. Hmm, they just upgraded WP today- that might have done something? You may try uninstalling and reinstalling although you may lose your customizations. Thank you for the very clear instructions! I have everything working pretty well but I’m wondering if there is a way to show the featured image in the image header? I’ve skimmed the shortcodes but they are all MC related and wondering if there is one that can pull in featured image somehow? Thank you! Thanks Mike. Sorry Im not really sure- usually the image is set in the template (if you could find a shortcode, Id put it there).If you cant find a shortcode then it might not be doable. Sorry. I have tried the above I get the subject to come in but I can’t get the content of the blog post to come in I’m I doing something wrong. Sorry Robert, I can’t tell what the issue is with the info you provided. My code in the template looks completely different and doesn’t have anything near line 392 that is opening or closing DIV. Do you have any instructions for the latest version of Mailchimp or have i constructed my template incorrectly? Sorry Rosie, Im not sure. I haven’t actually used this plugin in a while since Jetpack includes the same capability without the setup. Hi Heather, thanks for this article. I’m considerating not use AutoChimp plugin because is not being updated nowadays. Please let me know how you send blog news to an email list. What plugins and email list providers could you recommend me? Thank you ! Hi Lucas, I actually am using again… but it only transfers my blog post text to MailChimp (I don’t auto-send), then I have to go in and re-import the images. I know IFTTT has integrations from WP to MC but I haven’t tried them yet. Works great! But have you found a way to include images? I don’t use images in body content. 1) in MC, I chose my drag and drop template/which had my logo/layout etc. 2) exported as HTML (in the drop down arrow menu on the right of the relevent template). 3) edited in another program (my browser) the HTML code of the template as you described above. 4) In MC went back to Templates/Create Templates (left hand side top). 5) chose the option “code your own”/ “upload html”. From this point I was able to get it to work (not using the excerpt but the full body content). Note I use theme Divi and the page builder option for my blog layout. However MC obviously doesn’t recognise this “page builder layout”/tool. Instead I had replicate relevant content in the page section. Hope this helps someone; if anyone knows about how to get MC to pull the content from the divi page builder layout let me know! Great article. I couldn’t find this info anywhere else. Thanks for posting! Worked great for me. Hi Heather, Thanks so much for this. It works immaculately. Is there any chance you know how to make the title a livelink in the content? I know I’m pushing, but if you did, I’d use it right out. Sorry, I’m not sure. I don’t use the plugin anymore. So many years later and this still helped me a ton! Oh good, glad to hear it. Great article. I couldn’t find this info anywhere else. Thanks for posting!